1. Cook potatoes in a saucepan of boiling, salted water over medium-high heat for 15 minutes, or until tender. Drain in a colander. 2. Heat buttermilk (or full cream milk if you prefer) and butter in saucepan over medium heat. Add potato and use a potato masher to mash until smooth. 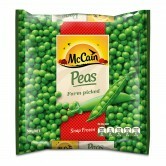 Add cooked McCain Peas and lightly mix in the peas into the mash. Taste and season with salt and pepper. Serve immediately. 1 Cook potatoes in a saucepan of boiling, salted water over medium-high heat for 15 minutes, or until tender. Drain in a colander. 2 Heat buttermilk (or full cream milk if you prefer) and butter in saucepan over medium heat. Add potato and use a potato masher to mash until smooth. 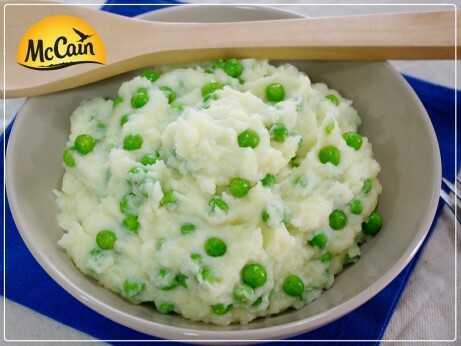 Add cooked McCain Peas and lightly mix in the peas into the mash. Taste and season with salt and pepper. Serve immediately.